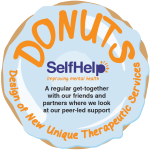 At our DONUTS group wediscussissues around the design and development of our peer based support. We look at how these services run and what we could do to improve them. DONUTS is for anyone who is interested in how peer supportis delivered. You might be: someone who has previouslyaccessed support from Self Help, a volunteer, a group facilitator, aSelf Help staff member at any level. We are also keen to welcome professionals from other mentalhealth services or public sector organisations along to share theirexpertise. Attendance is optional for all. or call 0161 226 3871.